Are you familiar with Notice & Note: Strategies for Close Reading? Here’s a link to Heinemann’s Notice & Note learning community, and here’s a sample PDF. I wonder whether our Standards for Mathematical Practice are similar to the Notice and Note literary signposts. It’s not enough to just read a text. We want students to read for understanding and comprehension. The literary signposts help students with close reading of a literary text. 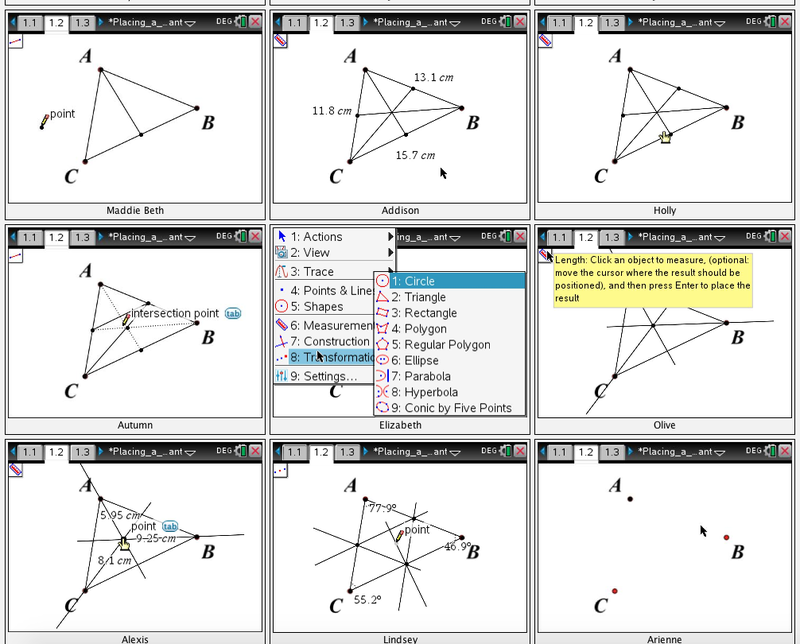 Similarly, it’s not enough to just explore math with dynamic graphs and geometry. We want students to explore for understanding and comprehension. 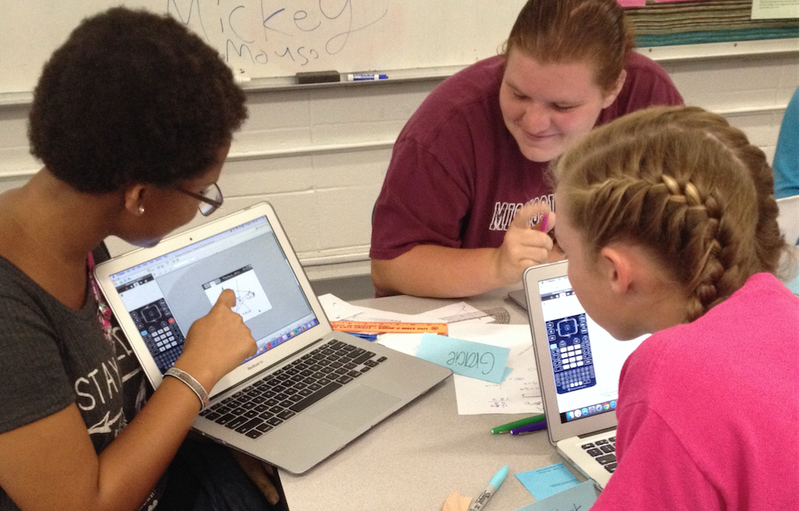 The math practices help students learn how to interact with a mathematical problem or concept … and what to notice. 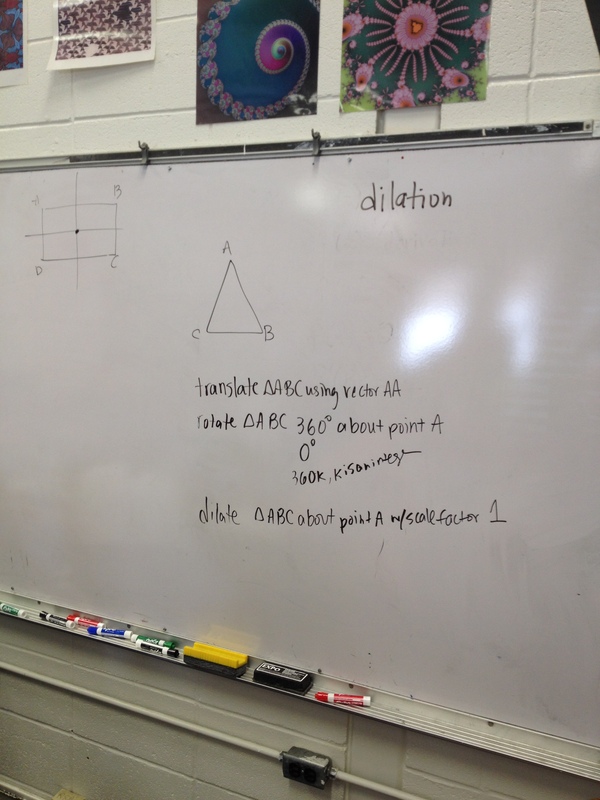 Last week, we explored dilations. What do you need for a dilation? 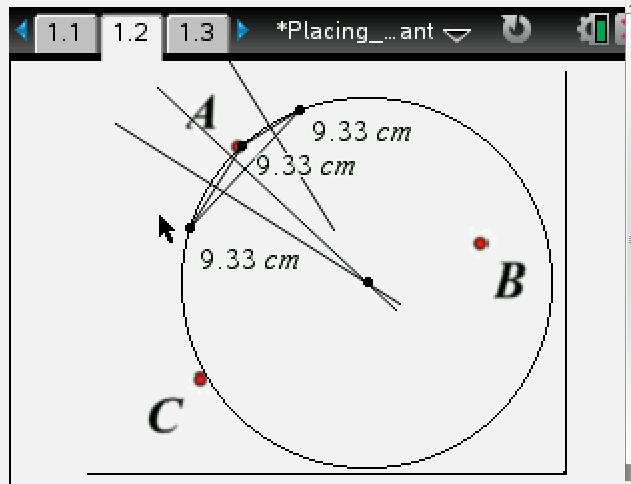 We used our dynamic geometry software to perform a dilation. About what things might you be curious as you explore dilations? What happens when the center of dilation is inside the pre-image? What happens when the scale factor is between 0 and 1? What happens when the scale factor is negative? How do the corresponding side lengths in the pre-image and image relate to each other? I asked students to practice look for and express regularity in repeated reasoning as they explored the dilation. Do you know what it means to look for and express regularity in repeated reasoning? Yes. Figure out what changes and what stays the same as you take a dynamic action on the dilation. Begin to make some generalizations about what you notice. And don’t just notice, but actually note what you’re thinking. The room got quiet as students noticed and noted their observations about dilations. 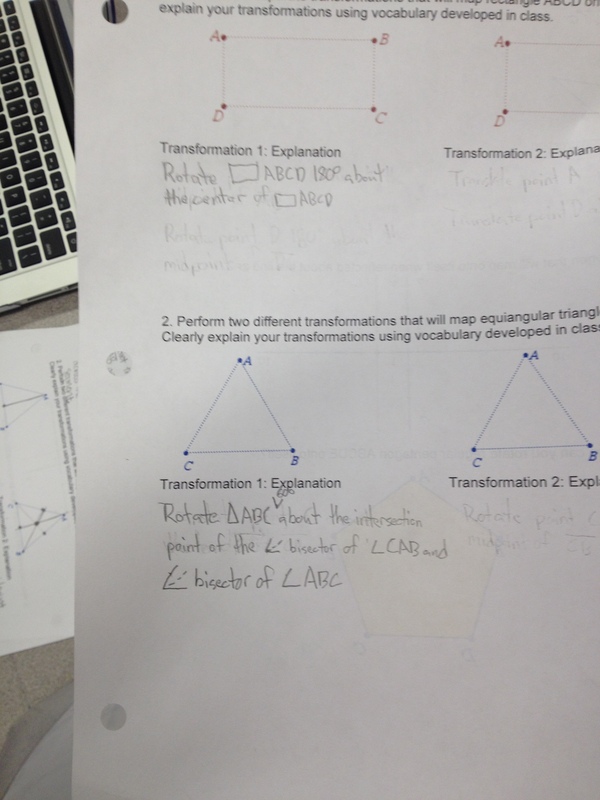 I monitored student work both using Class Capture and walking around to see what students were noting. Eventually, they shared some of their findings with their team, and then I selected a few to note their observations for the whole class. BB showed us what happened when he perfomed a dilation with a scale factor of -1. 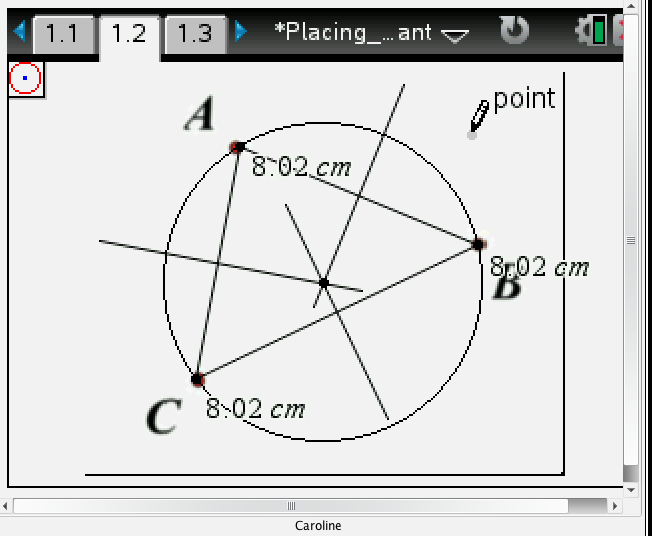 He had noted that it was the same as rotating the pre-image 180˚ about the center of dilation. SA talked with us about when the dilation would be a reduction. She had decided it wasn’t enough to say a scale factor less than 1 or a fractional scale factor but that we needed to say a scale factor between 0 and 1 or between -1 and 0. 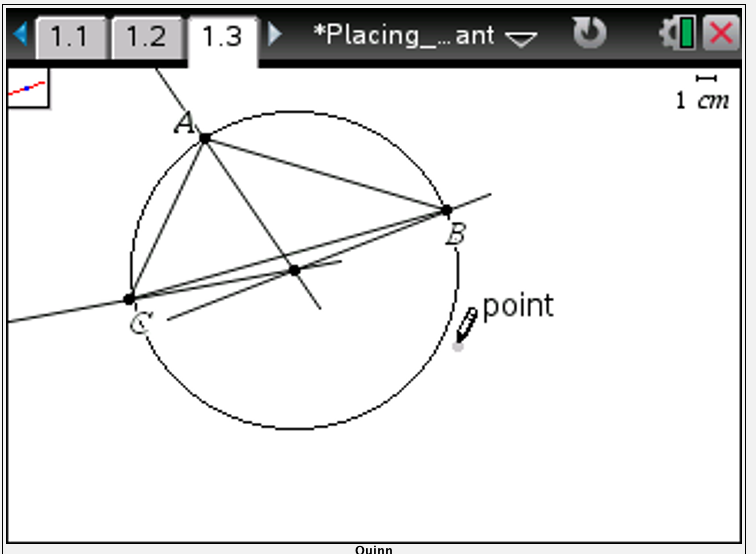 FK showed us that when she drew a line connecting a pre-image point and its image, the line also contained the center of dilation. 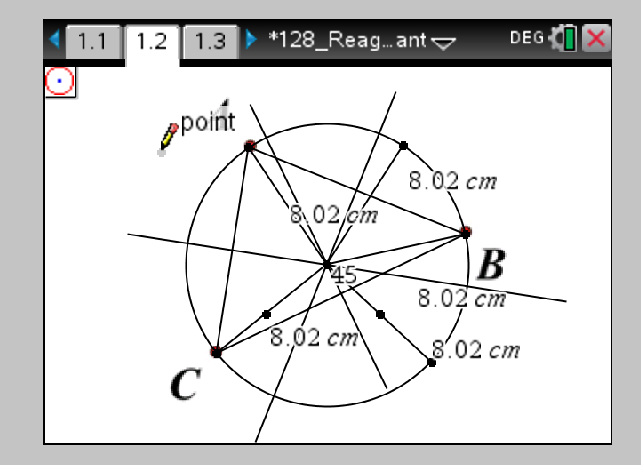 PS noted that when the scale factor was 2, the length of the segment from the center of dilation to a pre-image point equaled the length of the segment from the pre-image point to its image. 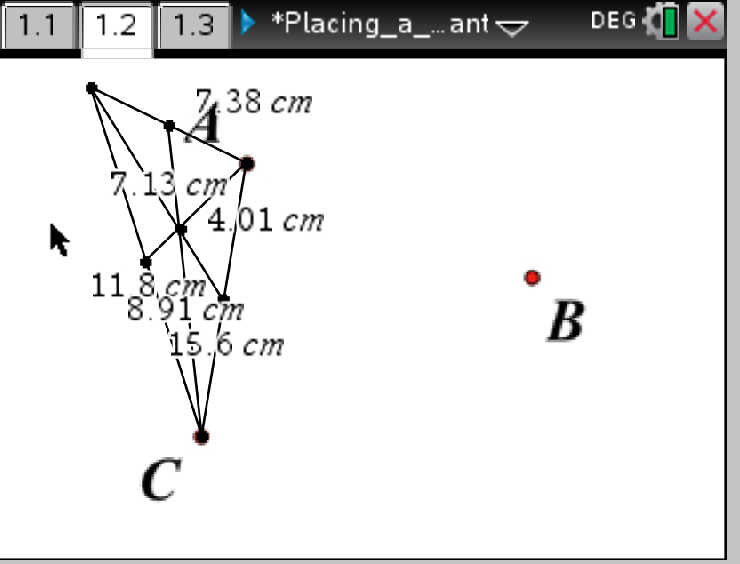 When the scale factor was 3, the length of the segment from the center of dilation to a pre-image point equaled one-half the length of the segment from the pre-image point to its image. 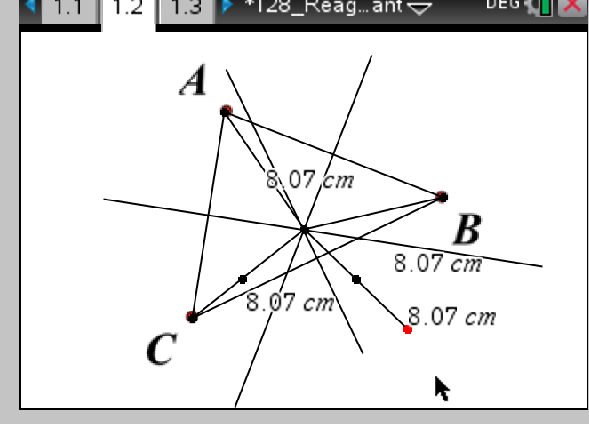 We next determined a dilation and set of rigid motions would show that the two figures are similar. Translate ∆DET using vector EY. Rotate ∆D’E’T’ about Y using angle D’YA. 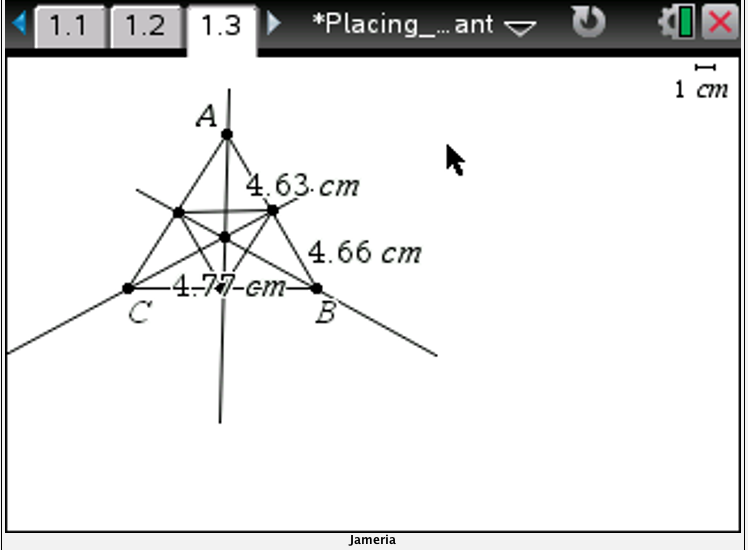 Dilate ∆D’’E’’T’’ about Y using scale factor AY/D’’Y. Then we looked at dilations in the coordinate plane. I knew that my students had some experience with this from middle school, and so I sent a Quick Poll to see what they remembered. Due to the success on the first question, I changed it up a bit with the second question. But I wonder now whether I should have started with the second question. If they could do the second question, doesn’t that tell me they can also do the first? I’ve rearranged the polls to try that the next time I teach dilations. 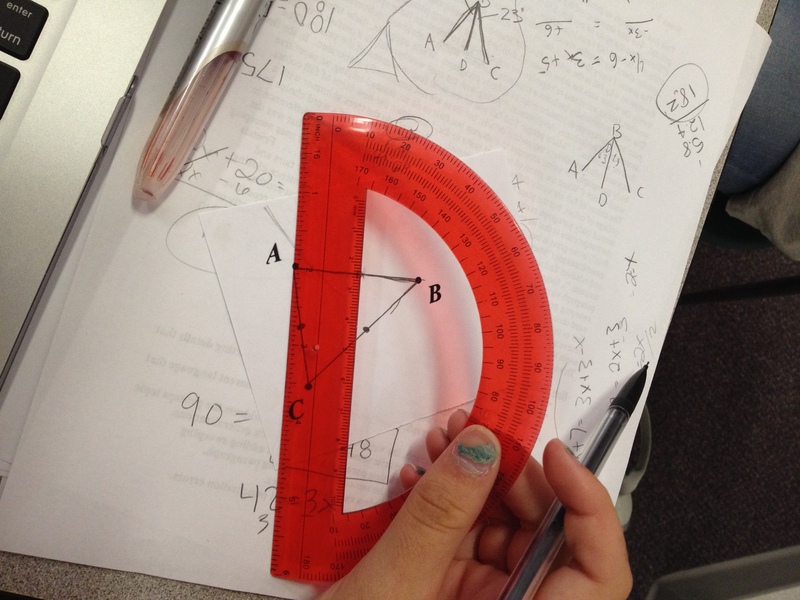 We ended the lesson with a triangle that had been dilated. Where is the center of dilation? We’ve used the Illustrative Mathematics task Placing a Fire Hydrant for several years now. Each year, the task plays out a bit differently because of the questions that the students ask and the mathematics that students notice. Which is, honestly, why I continue to teach. I set up our work for the day as practicing I can make sense of problems and persevere in solving them and also I can attend to precision. If you don’t know how to start at Level 3, use Levels 1 and 2 to help you get there. In an effort not to articulate all of the requirements ahead of time, I simply asked: where would you place a fire hydrant to serve buildings A, B, and C. Students dropped a point at the location they thought best. 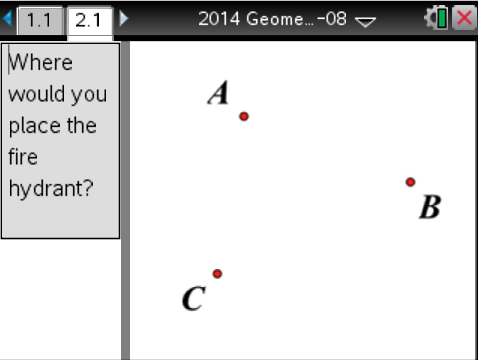 It was then obvious from the students’ choices that they thought equidistant was important. 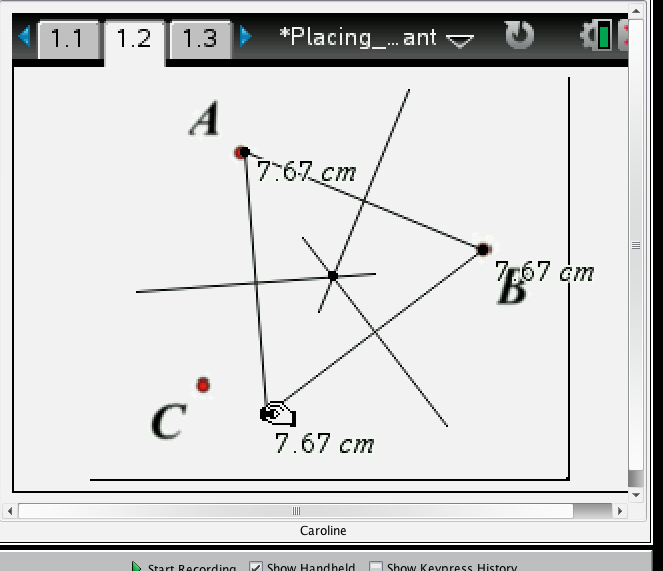 I gave students a few more minutes to work individually with the option, this time, of working with the TI-Nspire software to show their thinking. And at the end of that, I added a few more minutes, asking students to focus on how they could justify that their solution always works. Then I gave them a few minutes to discuss their thinking with a partner. 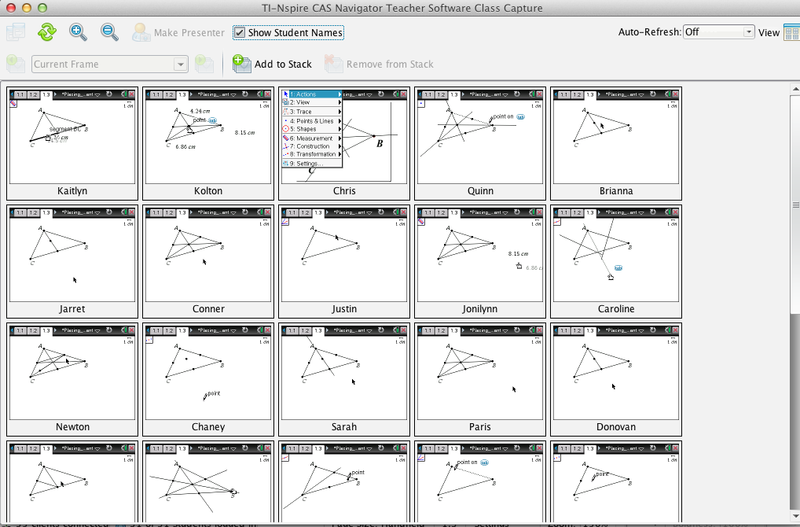 I watched (or monitored, according to Smith & Stein’s 5 Practices) while they worked using the Class Capture feature of TI-Nspire Navigator. During that time I also selected and sequenced for our whole class discussion. I wanted some of the vocabulary associated with special segments in triangles to come out of our discussion, so I didn’t immediately start with the correct solution. We started with Autumn, who had constructed the midpoints of the sides and then created both a midsegment of the triangle and some medians of the triangle. She could tell that the intersection of the midsegment and medians was “too high”. C chimed in that she had constructed lots of midsegments. In fact, she had created several midsegment triangles, one inside the other. Next we went to Addison, who not only had created all three medians of the triangle but had also measured to show that the medians weren’t the answer. That led to S, who had been trying to figure out when the intersection of the medians would be a good location for the fire hydrant. Arienne told us about her approach next. She had placed a point inside of the buildings, measured from the point to each building, and she was moving the point around to a location that would be equidistant from the buildings. Reagan talked with us about her solution next. 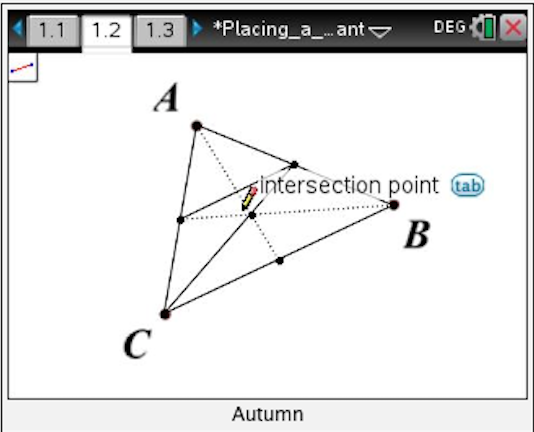 She had constructed the perpendicular bisectors and measured from their intersection to each vertex to show that it always worked. 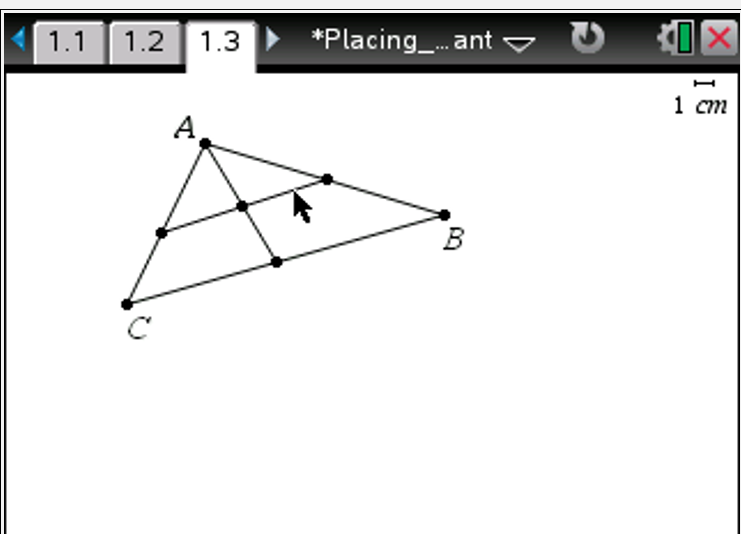 I wonder what that point has to do with the vertices. What do you see in the diagram? (I was expecting students to “see” a circle. But they didn’t. They saw a triangular prism.) I wasn’t ready to show them the circle, though. How could I help make the circle visible without telling them? A new question came to me: What if we had a 4th building? Where could we place the building so that the fire hydrant served it, too? I quickly collected Reagan’s file and sent it out to all of the students so that they could create a 4th building that was the same distance from the fire hydrant as A, B, and C.
How do you place the 4th building so that it always works? What is significant about the location of the 3 buildings and the fire hydrant? Sofia volunteered that her 4th building always works. (I have to admit that I was skeptical, but I made her the Live Presenter and asked how she made it.) Sofia had rotated building C about the fire hydrant to get d. (How many degrees? Does the number of degrees matter? Would rotating always work? Why would it work?) She rotated C again to get a 5th building between A and B. What is significant about the location of the 5 buildings and the fire hydrant? And then they saw it. It wasn’t yet pictured, but it had become visible. All of the buildings would form a circle around the fire hydrant! The fire hydrant is the circumcenter of ∆ABC. 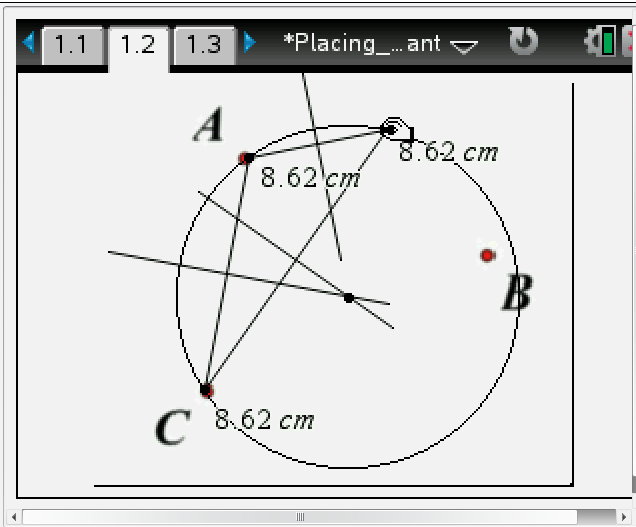 The circle is circumscribed about the triangle. And so the journey continues … every once in a while finding a more beautiful question. Towards the beginning of our geometry course, we give students a task from Illustrative Mathematics called Placing a Fire Hydrant. Where would you place a fire hydrant to serve all three buildings? Through a Quick Poll, students drop a point at the location they think is best. Then we introduce the requirement that the fire hydrant should be equidistant from all three buildings. 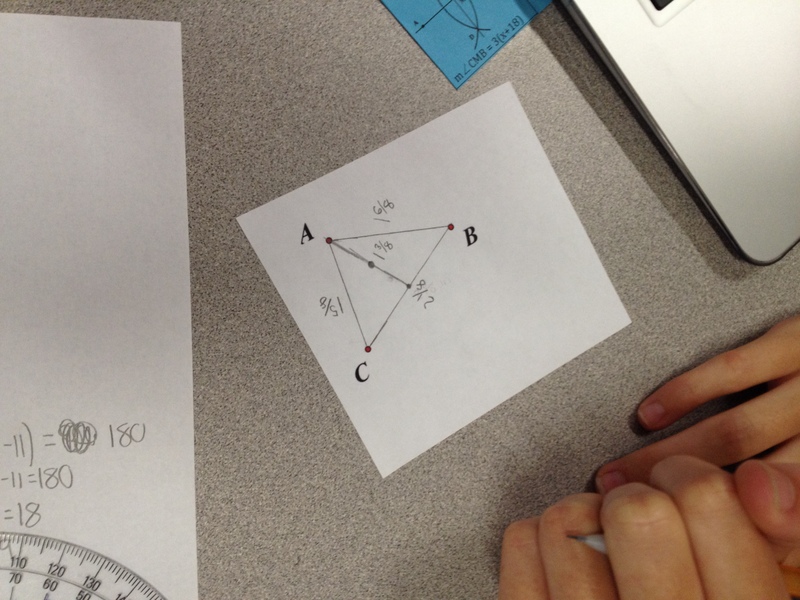 They started on paper, using rulers, folding, and compasses. the center would be equidistant (and thus the location of the fire hydrant). 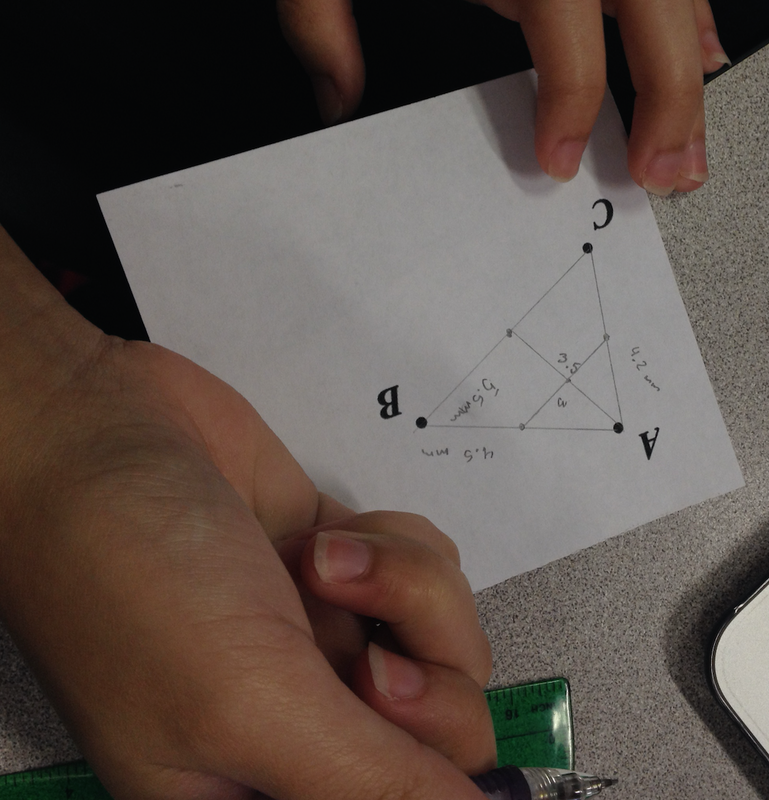 (which meant they didn’t already know everything they needed to know about triangle centers). Next they moved to technology. 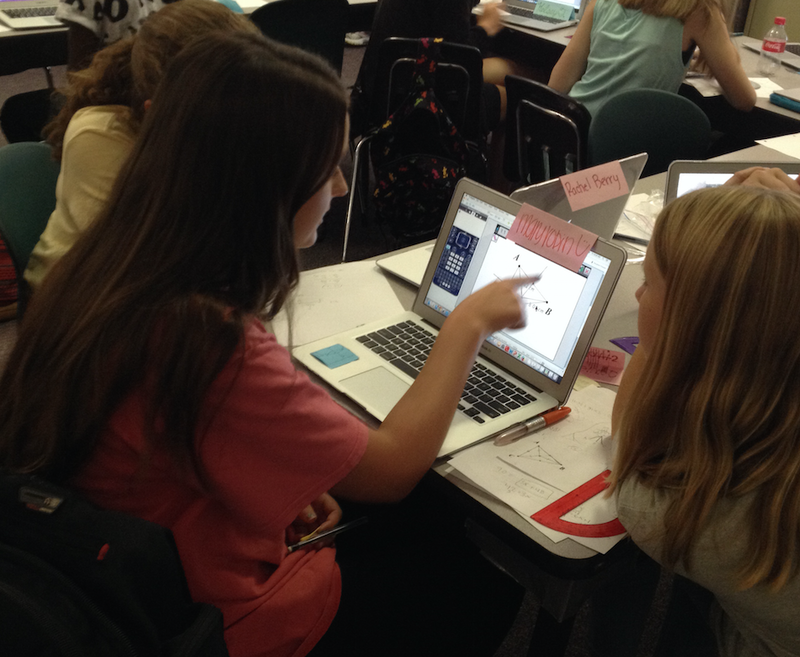 I watched while they worked using the Class Capture feature of our technology, and using what I learned from Smith & Stein’s 5 Practices for Orchestrating Productive Mathematics Discussions to monitor, select, and sequence the student work for our whole class discussion. My students didn’t come into this lesson knowing the vocabulary associated with special segments in triangles, so I purposefully included some incorrect solutions for placing the fire hydrant equidistant from the buildings to bring out that new vocabulary. 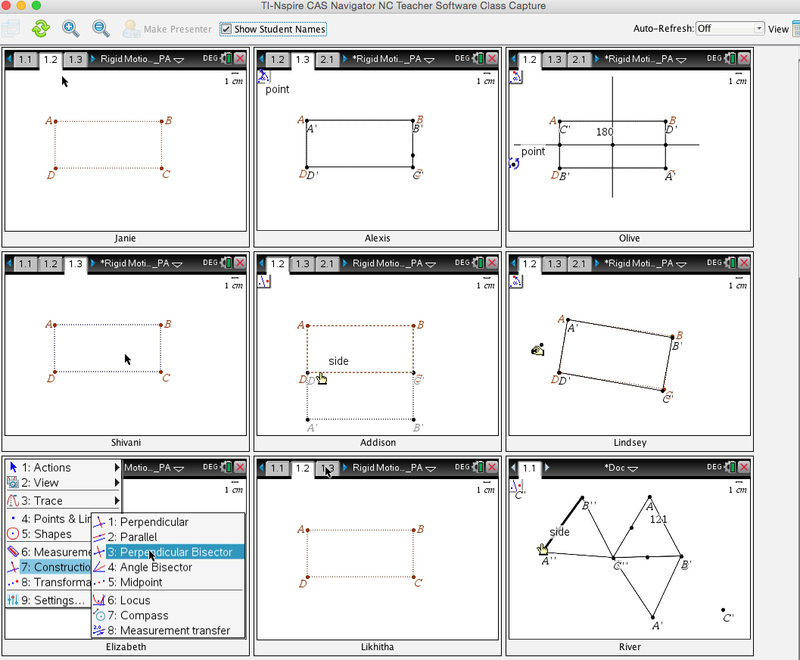 but the dynamic feature of our software let him move the buildings around and begin to consider when the intersection of the medians would be equidistant from the sides of the building. 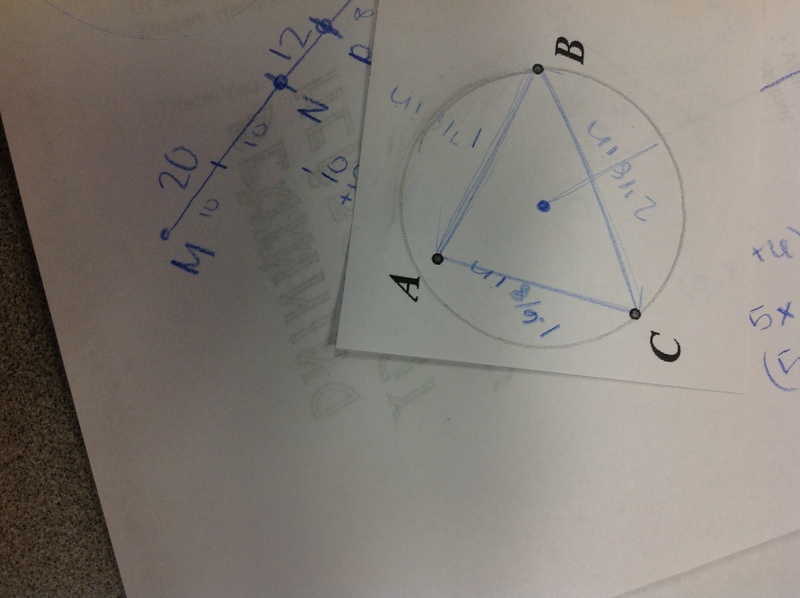 Chaney had constructed a midsegment of the triangle, and so we looked at hers next to learn that new term. 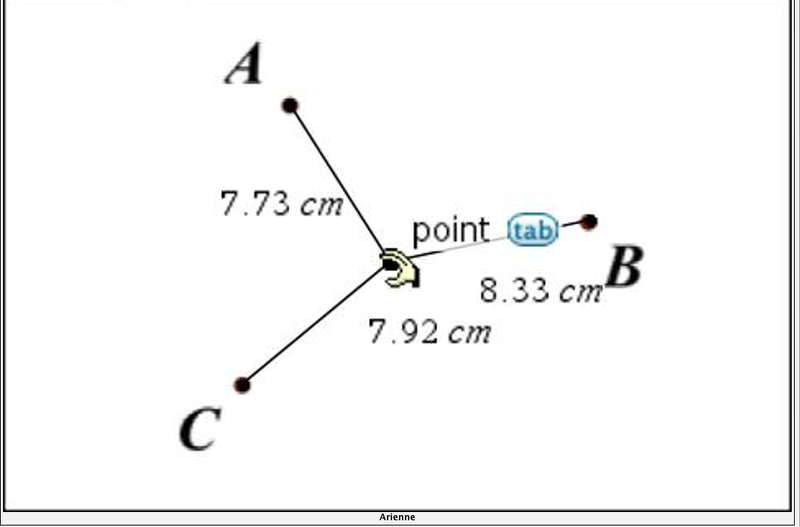 Jameria had constructed the three midsegments of the triangle, creating a midsegment triangle. 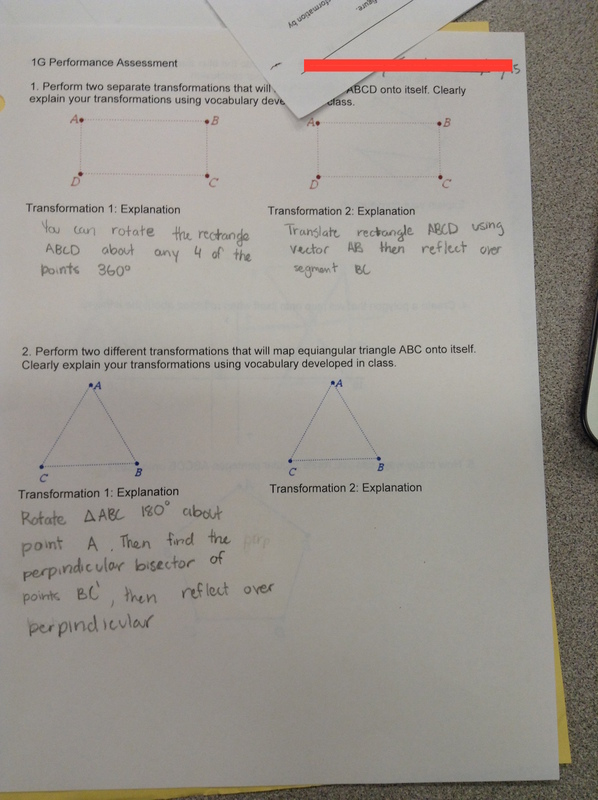 She was able to tell from her measurements that her solution didn’t always work, either, but we looked at anyway, and I told students that we would learn more about the midsegment triangle later in the course. We moved next to Sawyer, who recognized that the correct placement of the fire hydrant should be the center of a circle that contained all three buildings, but we could see from his work that he hadn’t yet figured out how to get a circle through all three buildings. Quinn had fashioned a circle through the three points, but still hadn’t actually constructed it. 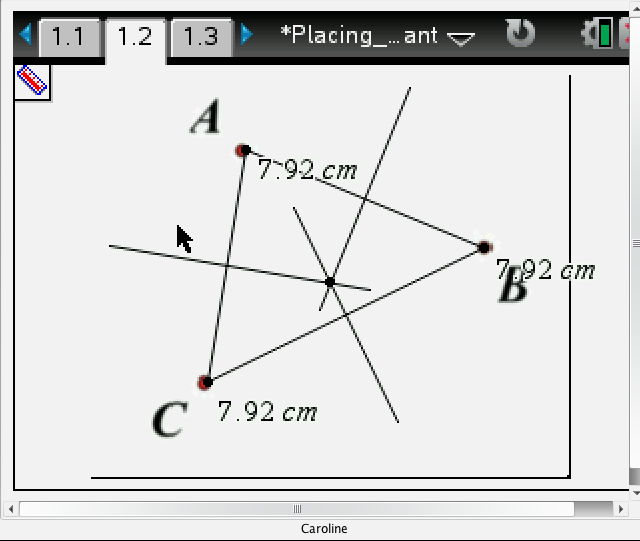 Caroline had constructed the perpendicular bisectors of each side of the triangle. 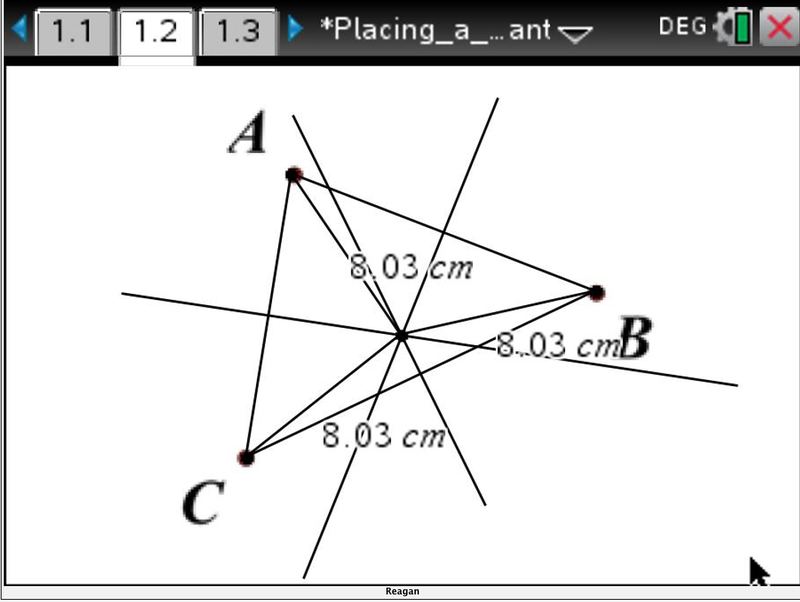 She had measured from their intersection, the circumcenter, to each building to show that they were equidistant. As the Live Presenter, she started moving the buildings around to show that her solution always worked. Then we asked her to construct the circumscribed circle to emphasize that the intersection of the perpendicular bisectors is the circumcenter. As Caroline continued to move around the buildings, Gabe asked, “Why would we put the fire hydrant there?” Caroline stopped, and we took a good look at the setup. She moved the buildings again, to exaggerate how ridiculous it would be to place a fire hydrant that far away. Our dynamic technology made the students realize that the circumcenter isn’t always the most efficient place for the fire hydrant, even if it is equidistant from the three buildings. And so we began to explore when it makes sense to put the fire hydrant equidistant from the buildings and when it no longer makes sense. 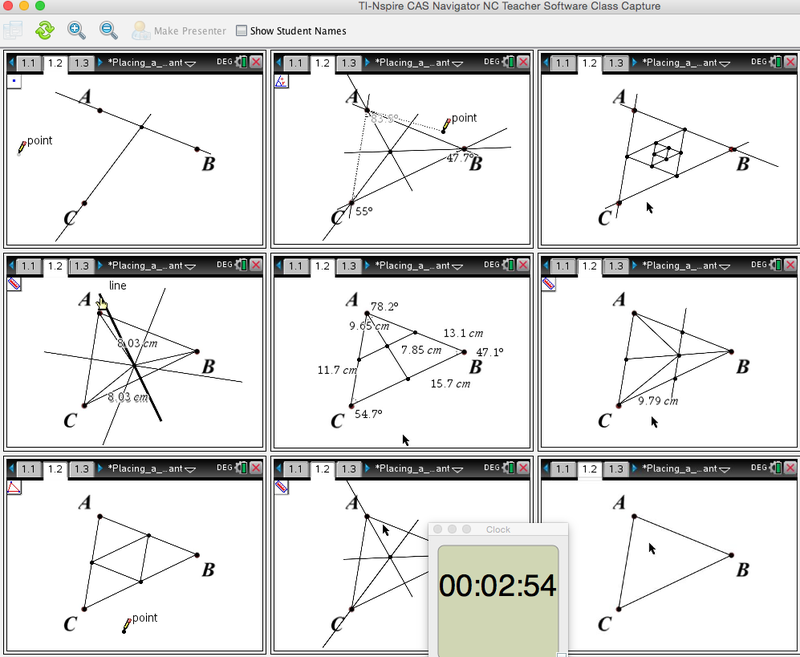 Take just a moment to contrast the Fire Hydrant task with how I used to teach special segments in triangles. Which one of these is the “Fast Math” option? Which one furthers the Slow Math Movement? The technology that we use provide the impetus for students to ask questions, which leads to more questions and some answers, from and by the students. I get to watch and listen and push and probe my students by asking more questions. What can you do this week to further The Slow Math Movement? G-CO.A.3: Given a rectangle, parallelogram, trapezoid, or regular polygon, describe the rotations and reflections that carry it onto itself. 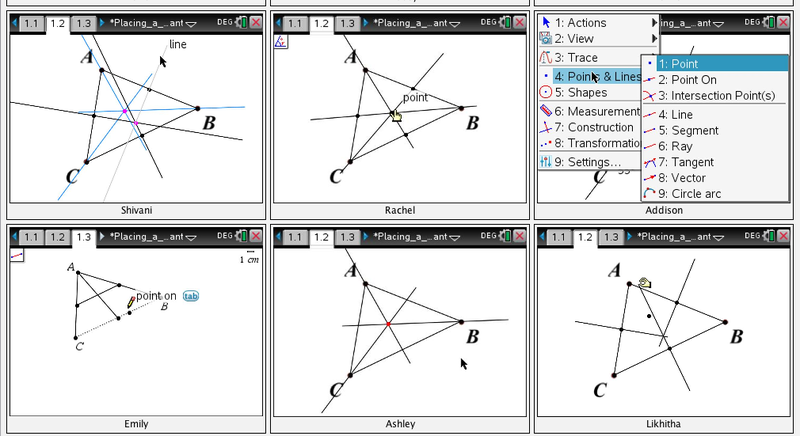 Our content learning goal for the day: I can map a figure onto itself using transformations. Our practice learning goal: I can attend to precision. Combining those, we were working on: I can show my work. Do your students know what you mean when you ask them to show your work? 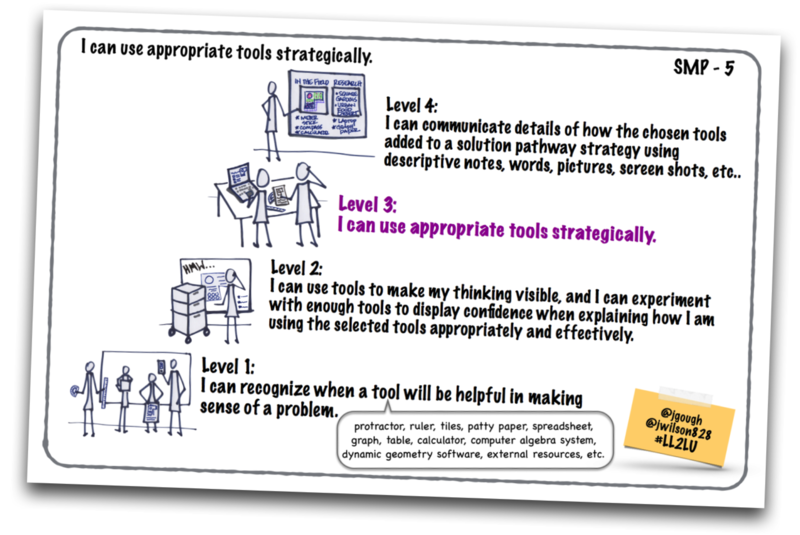 Jill Gough has written a transformative leveled learning progression for showing your work. This was our first day in geometry this year to focus on it. 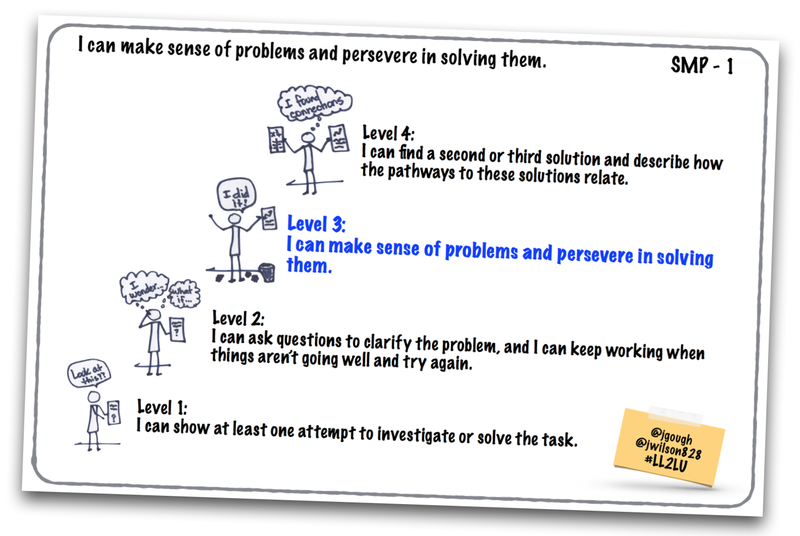 Level 4: I can show more than one way to find a solution to the problem. Level 3: I can describe or illustrate how I arrived at a solution in a way that the reader understands without talking to me. Level 2: I can find a correct solution to the problem. 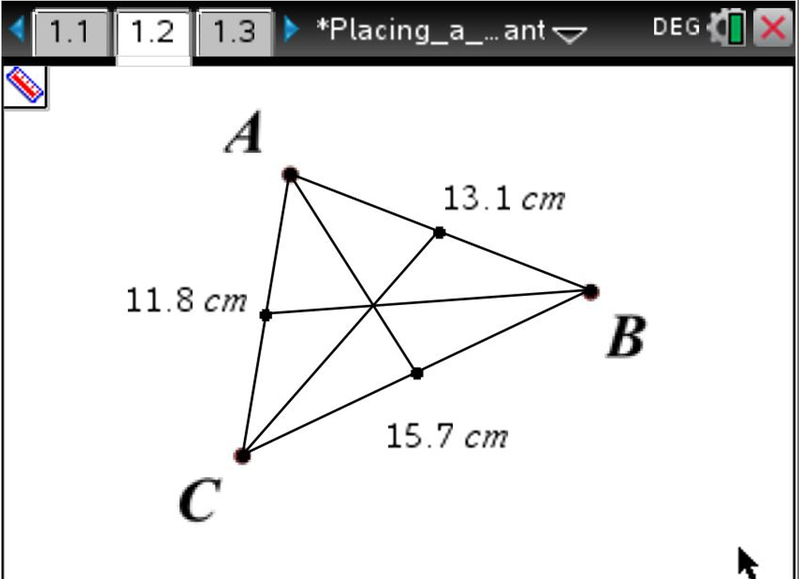 Level 1: I can ask questions to help me work toward a solution to the problem. 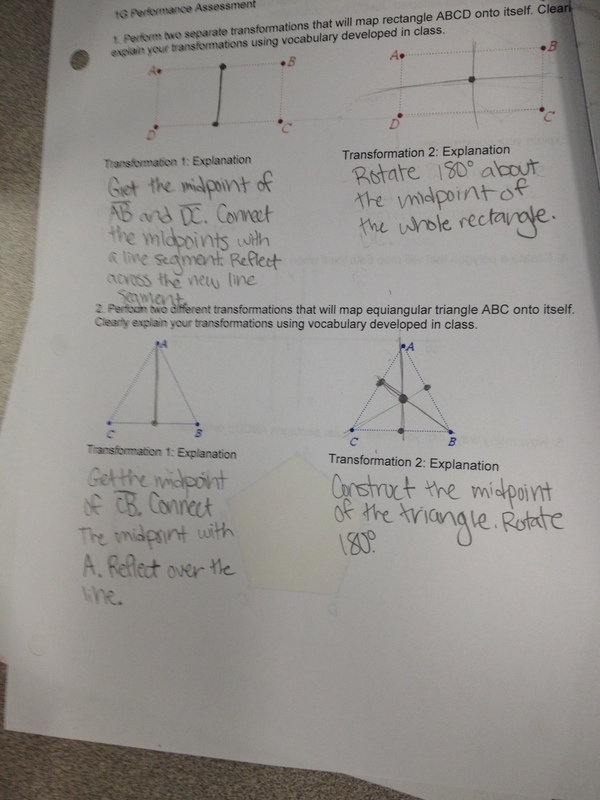 For this task, our focus was on describing clearly the transformations that would carry a rectangle or equilateral triangle onto itself so that a partner could follow the steps. Which of the following is clear? 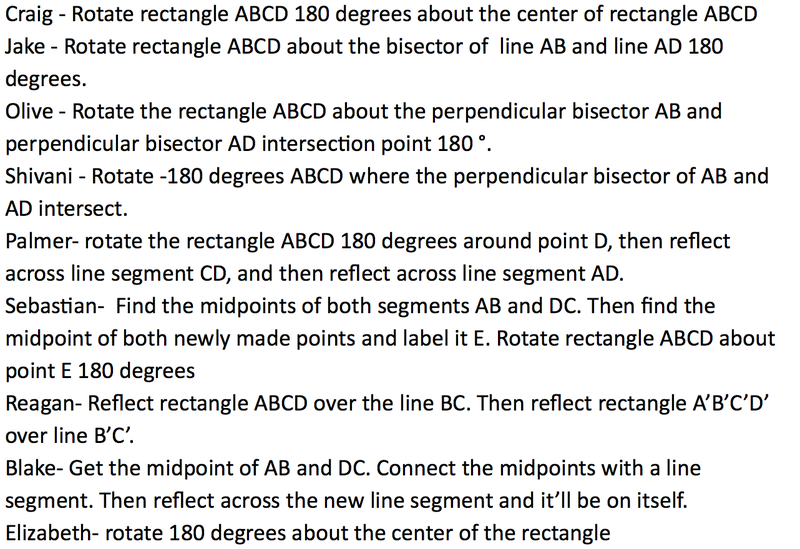 Reflect ABCD about a line through the middle of the rectangle. Reflect ∆ABC about its center. 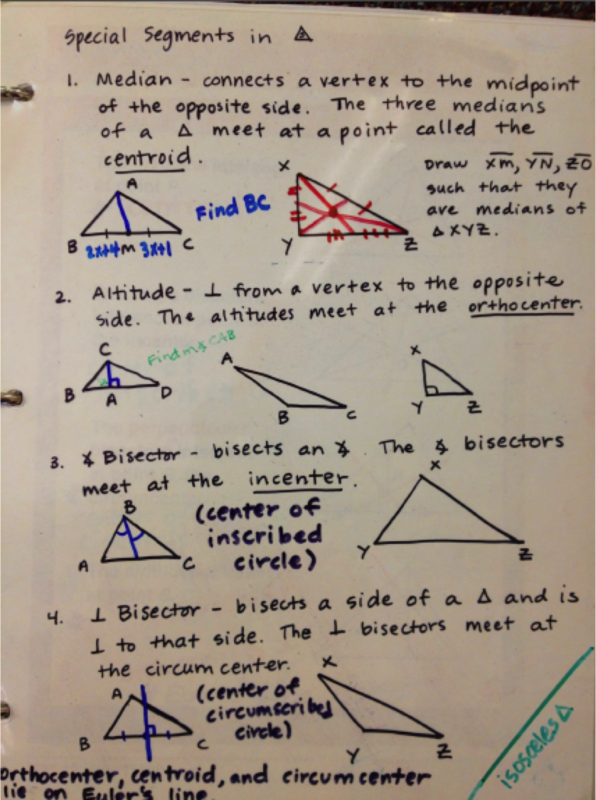 Reflect ABCD about the perpendicular bisector of segment AB. Rotate ∆ABC 180˚ about point A. Students set to work individually, paying attention to their language. I walked around to see what they were writing. 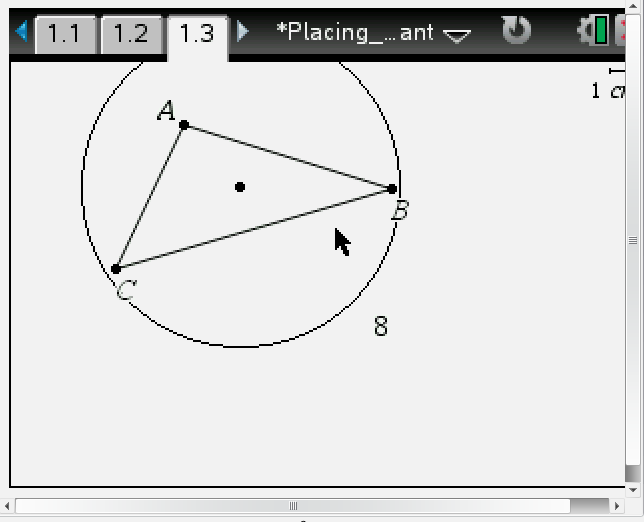 I noticed MR’s first, which said, Translate ∆ABC using vector AA. As I looked more closely, I realized that she was mapping the triangle on the left side of the page onto the triangle on the right side of the page, but even so, she had come up with a remarkably trivial solution, had she been mapping the triangle onto itself. The next student that I saw had rotated ∆ABC 360˚ about point A. 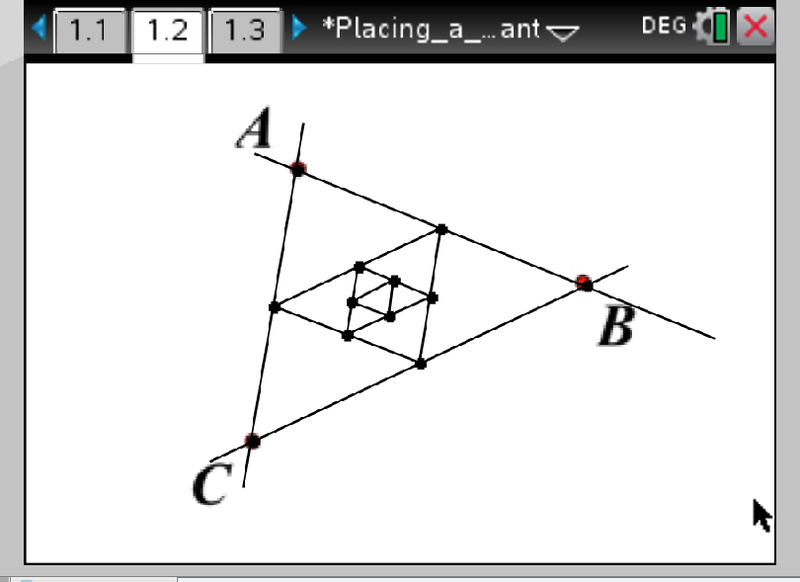 And then the next student that I saw had dilated ∆ABC about point A using a scale factor of 1. I decided at this point that perhaps a class discussion was in order to limit additional trivial solutions to this task. 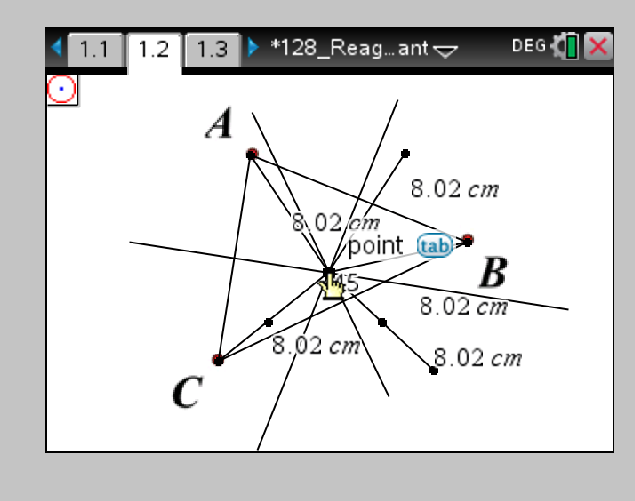 So we talked about transformations that will, of course, map the figure onto itself, such as rotating the image about one of its vertices 0˚ or 360˚, and also, really, are simple and not very interesting. And then I let them work some more. The idea was for them to write a transformation or sequence of transformations and have their partner try it, following their directions exactly. The partner helped revise the directions as needed if the directions didn’t work the first time. Instead of selecting particular students to share their work with the whole class, I asked students to write at least one set of their successful mappings in a shared Google Doc so that they could see multiple solutions to both the rectangle and the triangle.